Summary from Simon & Schuster Fall 2010 Catalog: In the zombie-infested, post-apocalyptic America where Benny Imura lives, every teenager must find a job by the time they turn fifteen or get their rations cut in half. Benny doesn’t want to apprentice as a zombie hunter with his boring older brother Tom, but he has no choice. He expects a tedious job whacking zoms for cash—but what he gets is a vocation that will teach him what it means to be human. Acclaimed horror author Jonathan Maberry makes his young adult debut with this detail-rich depiction of a post-apocalyptic world where humanity has fallen, the dead have risen, and danger is always imminent. 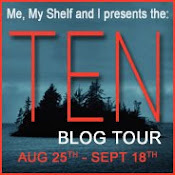 I didn't really like reading about zombies until I read The Forest of Hands and Teeth by Carrie Ryan. But, as soon as I was done, I was firmly on team zombie. 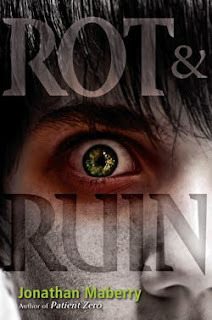 Rot & Ruin sounds like it will be a great mix of dystopian and paranormal. Plus the heading to Rot & Ruin in the catalog called it "An action-packed novel with ample humor, a little romance - and LOTS of zombies." Sounds pretty perfect to me. I sincerely hope you enjoy ROT & RUIN. It's less about zombies than it is about growing up in a damaged world and trying to find the value of human life. But there's also action, humor, romance, adventure and...yes...zombies. Not much into the whole zombie aspect of the paranormal, but I am sure that those who are will enjoy this one. Zombies! Post-Apacolyptic! Sounds amazing! The cover is really creepy O.O Great pick! Mr. Mayberry - Thank you for taking the time to comment. Your description actually makes me more excited to read Rot & Ruin. I have a feeling that the teens at my library will also appreciate your book as it sounds like something many of them would read and discuss. this one looks so creepy! in a good way! I haven't seen this before, and it's going on my wish list.